After a long service as president, ruler Abdelaziz Bouteflika resigned following mass protests. 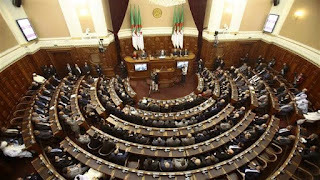 State news agency APS said on Saturday, Algeria’s parliament has decided to elect a new interim president on Tuesday. Algeria's parliament in meeting to decide on New acting president. 20 years of Bouteflika being in power will come to an end on Tuesday after a final nudge by the military, following six weeks of protests calling for democratic amendment for change after almost 60 years of monolithic rule by veterans of the 1954-62 independence war against France. Based on constitution, both chambers of the assembly need to formally confirm the vacancy of the presidency and elect an upper house president to run the country on an interim basis for three months until elections. This has pointed out the current upper house chairman Abdelkader Bensalah stands to become interim president as of now. Both Prime Minister Nouredine Bedoui and Tayeb Belaiz, head of a Constitutional Council who had formally received Bouteflika’s resignation, are facing pressure from protesters to quit as they are considered to be as part of an old guard which helped keep Bouteflika in power for 20 years. Result oriented, self driven, highly motivated, smart and hungry to learn new technologies, methodologies, strategies and Processes.